resemblance to his earlier Rumis/Blokus 3D than the more fiddly Arktia it’s a simple game of using your chunky wooden pieces to create a connection across the board. As a fan of Rumis, I was excited to hear the news about a new wooden abstract. The game actually comes with rules for point-scoring tournament style multiple matches as well as a somewhat contrived 4-player team game, but I’ll stick to talking about the basic 2-player game which is the by far most interesting part. With 2 players, each player receives a set of blocks with 4 Ls, 4 Ss and 4Ts and well as 2 chunky 2x2 squares, all very familiar shapes to tetris players. The rules are simple. Players take it in turns to place one of their pieces anywhere on the board. At least one face of the new piece must be touching the board itself (so you can’t build over 3 blocks high) and there can’t be any gaps left underneath the piece. The game ends when one of the players manages to complete a connection between opposite sides of the board. Unfortunately, the definition of connection is fiddly. 1 of the 4 pages in the rulebook is dedicated to defining it. Loosely, the path has to be completely visible from the top of the board and be connected via horizontal edges. With a few minutes of examples, you can get this across and be off. It’s all about the gameplay, and while trying to connect different sides of a board (or even four boards) might seem like a placid game of hex, the boards are actually really small and tight. 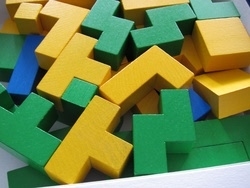 With the pieces you have, you could create a connection with only 3 pieces, so there’s no opportunity to sit off in a corner working by yourself here. Instead, the game forced you to continually block or cut your opponent’s connection attempts. Here’s where things get more interesting. Because the board are so small, it’s almost as easy to strike out from side to side if you’re blocked in your top-to-bottom effort. Good play usually requires trying to create a fork where you’re threatening in two directions at once. Good blocking play combines blocks with creating connection opportunities for yourself. Play can get frenetic with crazed attempts to block and run away until finally one player’s pieces rain down like an avalanche into a complete block. Something that becomes obvious after a few plays is the different uses of each piece. By far, the most powerful is the L-piece, which allows you to leap over a 2-high obstacle, but the others all have their uses and those wonderful opportunities where they are the perfect counter to your opponent’s attack. It’s also neat that the requirement for each placed piece to touch the board can leave opportunities later in the game to block out whole areas, just by covering the base layer. Once you’ve played a couple of games on the basic square board, you can try out the jagged square or the octagon boards which are interesting, but the torus board, which has a hole in the middle, so there are lots of choke points all over the place. These are much more interesting. There are also variants included in the rules for scoring multiple games played in a series, or for modifying the game board by placing two blue neutral pieces on the board before the game. The neutral pieces, at least, could be quite interesting once you get to know the ins out outs of each of the boards. I will repeat that explaining the fiddly connection rules is the least pleasant part about getting this game out to play with new people. I plan to take pictures of a couple of examples and make up a simple player aid over the next couple of days that folks can whip out and point to. Otherwise, I really like the game. I love fast-player small abstracts, and the intensity of the blocking and counter-blocking (as well as the cool chunky pieces) makes this a fun one, particularly given its fast playtime.